You may be thinking, what exactly is the Ditch Hitch and why should you use one. We are proud to say the Ditch Hitch is the safest engineered vehicle recovery system on the market. Our vehicle recovery system provides a practical, safe and easy to use solution for getting vehicles out of tough situations. This system eliminates the use of dangerous metal supporting objects such as chains and trailer balls. The Ditch Hitch vehicle recovery system, including the straps and vehicle recovery system, are made in the United States and Canada with the highest quality possible. Both the U-bar and stock of the Ditch Hitch are composed of marine grade aluminum. Due to the unique design, the aluminum has a greater load capacity than steel. The vehicle recovery system was designed to be compact and for ultimate strength. Weighing only 7.5 lbs, the whole engineered vehicle recovery system is 15% stronger and 67% lighter than the equivalent steel model. 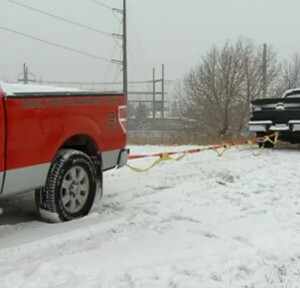 Unlike steel, the aluminum vehicle recovery system performs in extreme cold and has been tested in -55 degree Celsius weather. The Ditch Hitch is one of the few engineered vehicle recovery system on the market designed specifically for shock load vehicle recovery. It swivels 180 degrees to eliminate side loading. This system has been tested at the University of Calgary and by professional engineers. This engineered vehicle recovery system has a simple design including a vehicle recovery hitch that can be used in many touch situations and the unit is designed to withhold 69,000lbs. You may never need to use this system with that much weight but rest assured it’s been tested.